Our beautiful, No.26 Decorative Round Top Arch with it’s intricate design, makes a delightful addition to any garden. 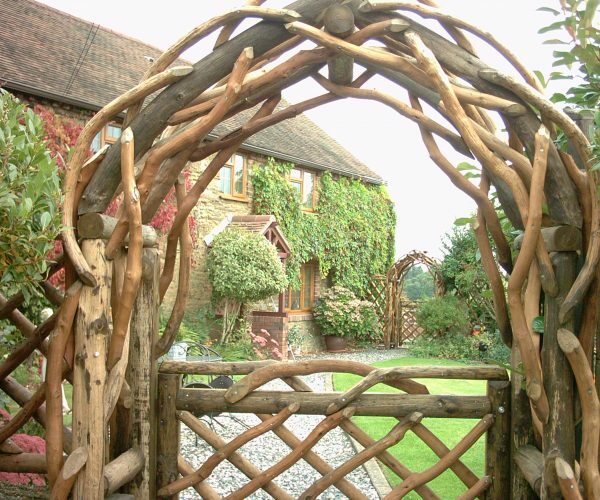 Oak sticks which we have steam bent ourselves, give nature a helping hand to add further beauty to the curved top of this arch, making it a focal point in your garden. Pictured here with a No.20 Rustic Gate. Please Click Here for help with measuring for your fence/arch/gate. Width – Made between 92cm/36″ to 122cm/48″ inside measure. Height – Will be in comparison to your chosen width. Note: You will need to add on approximately 20cm/8” to the width of your arch to account for the thickness of the sides. Lead Times – All of our products are made to order and we do not keep any stock other than the raw materials your order will be made from. Forward planning on your part is always advisable whenever possible in order to give us as much notice as possible as the manufacture of our products is a labour intensive and time consuming operation. Lead times can vary according to the season, but can get very lengthy in the Spring, and Summer. We will give you some indication of lead time at the point of quoting. Things to Consider – For the first few months, you may notice some changes in the wood. Although our furniture and fencing is treated, it is important to remember that as a natural material, round wood can sometimes be unstable and affected by weather conditions such as: Splitting or shrinking in periods of hot weather. Fungal growth may appear during periods of wet, humid weather. This can be eliminated by spraying with a mould and mildew remover and wiped with a clean cloth. Neither of the above affect the long term durability of the product. How to Pay – Payment can be made by cash or cheque on or prior to delivery. Cheques should be made payable to Coppice Creations. Payment can be made before delivery by bank transfer. Sorry, but we cannot process credit or debit cards. If we are making an order to your specific measurements, a deposit may be required before we start. Delivery – We can offer delivery in several ways. To determine the most cost effective method, we would require your post code to calculate the cost. We do not wish to profit from a delivery charge, but we have to cover our costs. As many of our products are heavy and bulky, assistance may be required to unload, but you would be made aware of this prior to delivery.